Fairy style is for people who believe in fairies. You see, the little fairy on this style is real. She is a real, true, paper fairy. Her flower wand, her little wings, her cute dress, the flowers surrounding her, and even the fluffy clouds in the sky, all tell about the magic that's in the world. Fill your birthday celebration with magic, and bring the fairies to it, with Fairy style! 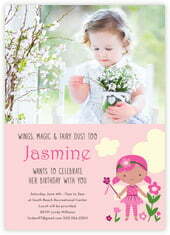 Customize your Fairy cards today!